Receive simple unlocking instructions via e-mail. You will have your iPhone unlocked very soon. Has your phone been blacklisted? Find out for sure with the Blacklist Check option below. If blacklisted, we will let you know in case you want to cancel your unlocking request +info. Unsure what country or network provider your phone is locked to? IMEI Unlocking Alternative. Guaranteed, Safe and Fast. Compatible with all iPhone models. Standard, Micro and Nano SIM compatible. Permanent Unlocking with Future-proof upgrade process. No need to keep UMS inside tray after unlocking. If you prefer, leave us your email and we'll get back when a direct IMEI service becomes available. Rest assured we will email you solely for this purpose. Thank you! We hope to be able to contact you soon. Type *#06# on the phone's keypad and send us the first 15 numbers. Can't find the phone's IMEI number? We will e-mail your instructions here. (Optional) You will be notified via SMS when your instructions are ready. Include GSMA Blacklist Check (+). What's this? Oops! Your payment was declined by your credit card provider. There was an error processing your payment with Apple Pay. Please try again or select a different payment method. Please check you request details before proceeding! This payment method does not support the currency selected. Instead you will be charged the equivalent amount in an accepted currency. IMPORTANT! We have noticed that you haven't included a Blacklist Check. If you think your phone has been blacklisted by the original operator (usually due to loss, theft or unpaid bills), we highly recommend adding this check as network unlocking your phone will not remove any blacklist restrictions. If you decide not to include the check and your phone is blacklisted, we will be unable to issue you a refund. This e-mail account is already associated to a reseller account. This email address is not valid. An error has occurred and we cannot complete the process. Check all details submitted carefully and complete all necessary fields. Try again and if the error persists contact us. Paypal does not support the currency selected. Instead you will be charged the equivalent amount in US Dollars using today's exchange rate. The iPhone 6 is Apple’s sixth generation Smartphone succeeding the iPhone 5S. Launched in September 2014, along with the larger-sized iPhone 6 Plus, the iPhone 6 quickly became a huge hit among Apple enthusiasts. 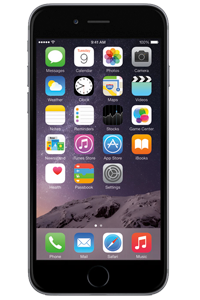 With its new Retina HD 4.7-inch screen, the iPhone 6 is larger than previous generations. Other features include a faster A8 64-bit processor, an upgraded camera and support for the new Apple Pay mobile payments service. But the best thing about the iPhone 6 is that you can unlock it fast and safe, with the quality you would expect with a phone of this magnitude. At doctorSIM, the price will be unbeatable, you will receive expert customer support throughout the service and the speed at which we unlock your iPhone will be as fast as its processor! To successfully network unlock an iPhone, the iCloud Activation Lock must be disabled. Find out in just a couple of minutes the iCloud status of your iPhone with our iCloud Activation Status check. The phone manufacturer’s warranty will remain intact and the iPhone never has to leave your side. Your iPhone 6 will be unlocked via e-mail and iTunes. Unlocking your iPhone 6 with doctorSIM is 100% legal, permanent and will not damage the iPhone in any way. We offer a full guarantee and will issue a full refund if for any reason under our responsibility are unable to unlock your iPhone. Unlocking iPhone 6 with doctorSIM is rated 4.8 out of 5 based on 67 reviews . Don't know the country of origin and network to which your iPhone is locked? Don't worry, we can tell you! Request an Original Operator check for your iPhone and we'll not only send you the name of the network carrier but a comprehensive report letting you know everything there is to know about your particular device. IMPORTANT! For us to successfully unlock your phone it is necessary that all information provided by you is accurate. Hey! We've noticed that you are not using the Safari web browser. If you wish to use Apple Pay, please open doctorSIM.com with Safari.